I am a principal, a founder, and the managing partner of HCP. In over 30 years of practice, I have served as lead trial counsel for concerns here and around the country in the areas of product liability, employment, environmental, toxic, medical/medical device, insurance, and insurance recovery litigation. I also lead the firm’s Litigation Management Group that coordinates litigation for both public and private company clients, locally and nationally. The privilege to represent our clients has been earned over a lifetime of hard work and commitment to client objectives and problem solving. The skills that have made this succeed started with a caring and creative family, with roots in farming, business, academics, music, and athletics. They were built upon an education at the University of Vermont and Case Western Reserve University’s College of Law. 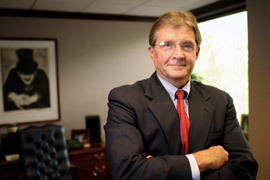 They grew over many years of defending and trying cases for health care providers, tire manufacturers, paint and coating companies, contractors, school districts, the paper manufacturing industry, chemical companies, architects, attorneys and other professionals, the trucking industry, and communication companies. A competitive nature and 24/7 work ethic have carried over into competition water skiing and snow skiing. I founded the HFL (Hanna Football League) and played in it for 20 years. There have also been many years of service to our bar association, community charities and foundations, the Summit County Children Services Board, and our hospital institutions. Experience has given me, and the team that works with me, a unique understanding of the markers of a successful enterprise and the ways to effectively prosecute and defend litigation that may be necessary over the course of time. If I, or HCP can help you or your organization in any way, please feel free to call me.